As September eagerly approaches we're reaching the end of my gap year. A well needed year away from education and, as it turned out, blogging. The last time I hit publish on a blog post was October 2016. After so many months away, the once familiar act of sitting down and typing out my thoughts seems almost alien. I never intended to pack it all in permanently. But a weeks break quickly became a month, that month became two and before I knew it Yours, Chloe had lay abandoned for ten months. I'm sure assumptions are made when bloggers 'quit', that they gave up due to the frustration of lack of success. 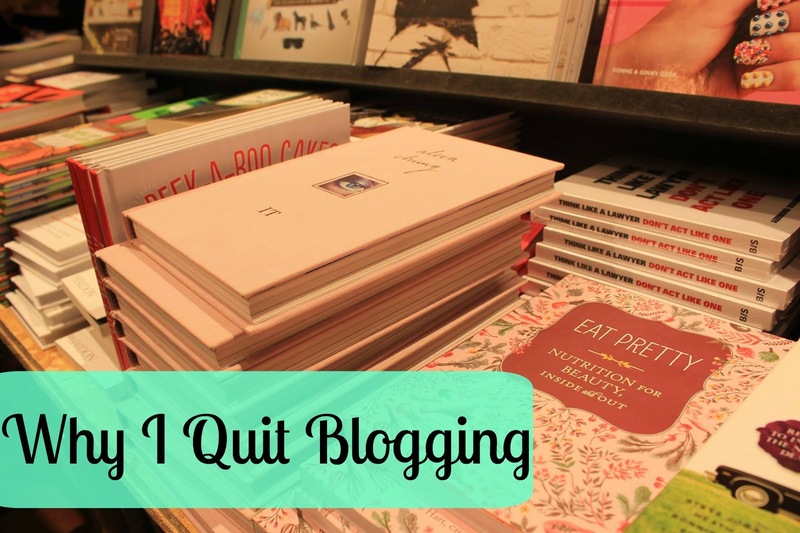 While this will inevitably be the reasoning for a number of bloggers, for myself the reason was a whole collection of little frustrating things about the blogging world that I eventually grew tired of. Lack of appreciation is something that continues to frustrate me greatly about blogging. As anyone who has ever written a blog will know, the vast majority of posts will take hours to plan, write and edit. Unfortunately this hard work often seems to be over-looked. It's also becoming evident that the internet's eyes are now firmly glued on the media of YouTube and as a result the written word seems to be generally getting less of the appreciation it deserves. Lack of success is a topic I would like to examine, as its annoyances are definitely something I can relate to, which in part contributed to my blogging hiatus. I would like to stress that I didn't start blogging - nor continue it - with the aspiration of huge success or 'becoming famous'. I entered blogging with a passion for writing, a desire to share my thoughts and to connect with like-minded people. The way blogging should be. But as blogging has grown it's becoming very centred on your success and the number displayed next to the phrase 'follower count'. Blogging has become a competition: who has the most followers; who nabs the best brand collaboration; who has the most insta-perfect photos. As bloggers we seem less focused on the value of the content we are creating and more focused on becoming what is now deemed as successful. I will of course throw my hands up and admit that at times I have centred everything around my blog's 'success' and put a large focus on the statistics. I've found in the past I've not composed some of the posts I would have liked to in order to stay within the lines of the typically popular posts. The focus on 'How many views will this post get?' definitely takes away from the enjoyment of creating the content. On top of this, the benefits of a regular posting schedule are something which has been heavily publicised within the world of blogging, making it the done thing by all 'successful' bloggers. Whilst I appreciate that such a schedule may indeed have a positive effect, I have found that working to a schedule has meant that on many occasions the posts that I hit publish on weren't ones I was especially excited about or proud of. And let's be real, what's the actual point in taking the time to create content that at the end of the day you're not fussed about. A little point, but I also dislike the move blogging seems to have made away from creativity. In recent years everything seems to have become very same-old same-old. Even the photography seems to have lost its creative flair - will I be banished if I say I can't stand flat lays? At the end of the day I started to blog because I was passionate about writing and that is something I wish to return to. I want to get back to creating posts that I love, rather than posts that may make Yours, Chloe commercially attractive. My time away from blogging has awoken me to the negatives of the industry and made me realise how much I disliked the attitude to blogging I was developing. But I'm now refreshed and back in the blogging chair. And boy does it feel good. So glad to have you back, Chloe! I also find that sometimes I can get a bit too hung up on stats, which leaves me feeling really unsatisfied with myself and pretty downbeat about blogging! However, when I don't focus so much on the numbers and instead just enjoy the content I produce, I feel a lot more fulfilled! You're coming back to blogging with open eyes about the negatives which is a good thing, now you can just focus on enjoying yourself! I really appreciate your honesty as I think a lot of bloggers feel like this. I have always said if I ever don't enjoy it then that is when I will stop or take a break. Im glad your back, I think we all need to forget about the number count and blog for the fun of it! I'm glad you came back! It's easy to get disheartened when you focus on your stats, but I'm glad you found your passion again! Glad you're back into blogging. It can always to have a break and get back all refreshed! Do what you love ! What a lovely, honest post. As a newbie, I do feel quite daunted sometimes when I look at other bloggers' stats, followers, photos, etc. But then I remember why I started, because I love writing and I wanted my own little creative space that was all mine. Thank you! Hi, welcome back to the world of blogging. I admire your honesty here's to you doing what you are passionate about and your future posts, Chloe. I resonate with this post so much - it feels almost like you plucked the words right out my brain! I've been having this battle when it comes to blogging for years. I come and go with months in between because of the frustration I feel towards it. I never started for success or to be well known, just for the same simple reasons so many did, but the pressure built up and just like yourself I was publishing posts I'd pushed myself to write. I tried to set a schedule but started to restrict doing spontaneous things, I even started going to things just so I could blog about them knowing I wouldn't enjoy myself which now seems, quite frankly, ridiculous. It's good to take a break from it all, whether it's a week or ten months. Welcome back though, I look forward to reading your posts from here on out!